Wait til' I tell my blog readers about my "Gotcha" moment today. You will find it funny, I promise. First I just had to share this little cartoon I found hysterical, especially because my little practical joke had to do with a singing audition. I looked for a graphic for this post and this came up and I had such a good chuckle, just HAD to share it. Second, ...I'll just say we had a great service today...God moving mightily in the gifts of His Spirit, and more. I was wondering just how tired folks would be from daylight savings time and if it would affect much but it was a great day. Some highlights besides the great service were see our precious Maddie again for the first time in five days. Heather and Troy and their family have had her all this time, sitting for us while we were in Orlando. They brought her to church this morning. (We keep her in her kennel in our office during church.) I couldn't wait to see her and plaster her with kisses. Her whole face had my pink lipstick all over it! I mean it was one of the worst sounds I've ever heard. It was as bad as some of the worst American Idol auditions. And she kept going, so sincerely and it got more and more pitiful. I was trying to not show my shock while at the same time being so disappointed inside. I had such high hopes of her being a powerful addition to our team. Plus in the short time I've known her, I just adore this woman...she's amazingly sweet and helpful and has actually just helped me with a decorating project at my home. (Did I mention she's an interior designer too? What can't she do?) So I'm thinking, "how am I going to let her down easy? What nice way can I tell her, this is horrible?" I was going to do the Paula Abdul, "Okay, first of all, you look great!!!" (Because she really did! She always looks like a million bucks.) But I knew I would have to say something about her voice and I was dreading it. 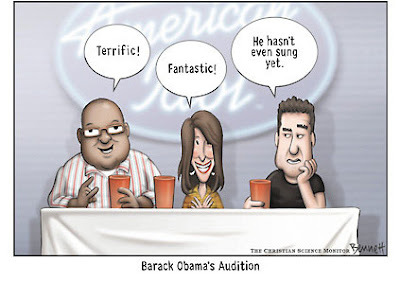 I mean, seriously this audition was HORRIFIC. And it was beautiful. Absolutely beautiful. She sang one line, looked at me with a huge smile and pointed and dramatically said, "Gotcha!" and continued on to sing the rest of the song with an absolutely stellar not to mention anointed performance!!! When it was over I said, "Oh my gosh, you had me! You had me!" And we laughed almost til' it hurt and then she said, "I wish you could have seen your eyes when I sang the first line. I know you were trying your best to mask it but Pastor Deanna, I could see the shock in your eyes and your angst over what in the world you were going to say when it was over... "
When we came out of the choir room her husband Mike (who is also a real jokester) and my husband and another couple who are their close friends (David & Gayle who brought them to the church in the first place) bursted out laughing at me that she got me with this joke. They all knew ahead of time that she was going to do it. The joke was on me...and boy was it effective! God gives me these cool sayings sometimes. I would have loved to have been a fly in that room!